Catholics consider the pope to be their god’s representative on earth. In other words, anyone who declares himself or herself to be a Catholic necessarily believes that what the pope says about the nature of the universe is absolutely correct. So now consider a few of the current pope’s pronouncements. Just those few lines explain quite a bit about what’s happening in India. The UPA is headed by an Itlaian Catholic. She is bound by her faith to follow the dictates of the pope, the highest authority in the Catholic church. She in turn dictates to her minions, particularly Mr Manmohan Singh. He, and the other lackeys that she has in her stable, obey. Director Singeetham Srinivasa Rao says his production will have an all-Indian cast of child actors, featuring seven devotional songs. Producer Konda Krishnam Raju said at a news conference Tuesday that the film focuses on the childhood of Jesus, a contrast with other movies that depict his later years. “This is the first presentation of this type in Bollywood history,” he added. At $30 million, the filmmakers say, it’s one of India’s highest budget movies. An average Indian movie costs about $500,000. The story adds that there are 24 million Christians in India, suggesting there’s a market for the movie although given the amount of money reportedly budgeted to make the movie, the filmmakers have to be hoping that its appeal will be far larger than Christians alone. The story also suggests that there are Bollywood movies based on the life of the older Jesus. If anyone out there can point us to some examples, that would be appreciated. The UPA is headed by an Italian Catholic. She cannot be held responsible for being Italian (very few people have a choice in where they are born), and to some degree cannot help being a Catholic (most of us adopt the religion of our parents). Being an Italian Catholic, she has to follow what her religious authority, the pope, dictates to her. The pope in no uncertain terms calls Hindus inferior to Christians and in the clearest of terms lays it out that evangelisation is not optional. So let me also spell it out: the UPA head has to promote evangelisation of Indians because it is mandated by her religion. But let me hasten to add that it is not her fault. I would do the same if I were born an Italian Catholic. The fault, boys and girls, lies with the brain-dead stupid cretinous retarded moronic non-Catholics who vote the Congress party. That group largely consists of Hindus. In effect, these retards are making sure that their heritage is totally lost, that their culture is destroyed, that they repudiate the tradition of their ancestors. These are the real traitors of the motherland, these are the real rapists of mother India. The next time you see a Congress supporter on the streets, remember that these are the people who are responsible for the dire straits that India is in, and that there is much worse to come if these unmentionables continue to vote the Congress into power. Frankly, my dears, I am disgusted by the rank stupidity of Indians who support the Congress. They deserve the crap that they endure day in and day out. On the 16th September, Pope Benedict XVI will descend upon the United Kingdom. The cost of his visit, not including security, is £20 million. 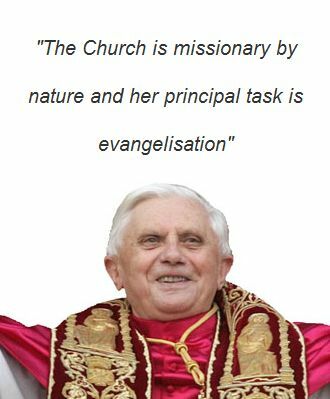 Many people in Britain object to public money being spent on this visit, particularly given the abundant wealth of the Catholic Church. Imagine what could be accomplished if this money was spent on a worthwhile cause. The British are Christians too (not the Catholic type mostly, though) but even they have some sense that the pope must be resisted. Indians? I see that the evil woman “Mother” Teresa is being celebrated in Kolkata. Some Indians evidently delight in wallowing in their own debasement. my friend, this is not a blog for bleeding heart liberal commies. please stay in JNU for that.this is for rational, unabashedly patriotic, development-minded readers who are interested in getting modiji to power. we must first agree that congress is real enemy. i welcome you to join our noble cause. >>Given the fracas over Babri Masjid, the behavior of the christians is exemplary in this matter. You could say Christians behaved in an exemplary manner in Prof Joseph’s case as well. If Islamists hack peoples’ hands, the bilious Hindus might stage a Godhra reprisal, but Christians? They go beyond restraint. They punish the victims twice over. They rob them of their jobs. Likewise, when Islamists burn a church, Christians fall in line and keep quiet. But I am not sure if this admirable “restraint” would be shown if the mud wall of a thatched-roof hut-church is so much as scratched by Hindu tribals in Orissa. A campaign against ‘persecution’ would be under way on TV within no time, and the US taxpayer-funded crypto-religious outfit called USCIRF will be staging a song and dance about “religious freedom” in India. The intention behind harmless secular myths is probably laudable, communal harmony and all that, but an ostrich stance is not necessarily healthy. It is patronizing and dishonest. Indian Christian “restraint” in the face of Islamist attacks is part political (the unity of “minorities”) and part pragmatism (what can they do about it, anyway)? its amazing to see how a white hindu defended hinduism against the treacherous christian conversions, please explore. There are other white hindu blogs on the web as well, so guys and gals draw some consolation from same..
CASTE CENSUS is a ploy by the Congress to institutionalize and divide Hindus permanently on Caste lines, and then exploit it – by consolidating Minority Votes. Wish RSS and other like minded organizations oppose Caste Census, since others seem to have resigned to the fate of deeply divided India (hindus) on Caste lines. I’m kind of shocked by the level of your allegations. Just because Sonia Gandhi is a christian doesn’t mean that she would wantonly insist on evangelisation. Just because she is a christian doesn’t mean that she will follow the Pope’s diktat always. And where is the connection between her & bollywood? Of course there are a lot of forcible conversions happening, but what’s the evidence linking them to Sonia? I’m sorry, but your claims are misfounded. You are either misquoting or quoting out of context. 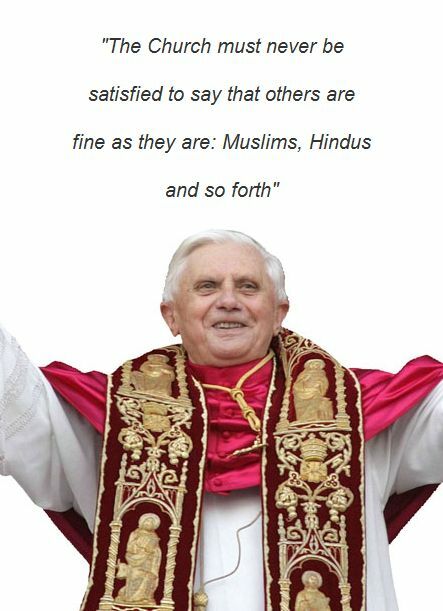 In no way did Pope Benedict XVI EVER refer to HIndus as inferior. Furthermore, Pope John Paul II, in his encyclical Fides et Ratio (Faith and Reason) actually praises the nation of India for its spirituality!!! Little do you really know about what our Popes say. I suspect, rather, that you are anti-Christian and trying to turn people in India against Christianity. 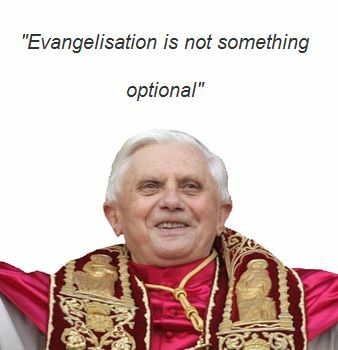 Last but not least: NO REAL CONVERSION can take place without the grace of God and the FREE CONSENT and desire of the person. Without these two things, the so-called conversion is but a farce. Most people are not aware of the 93rd amendment in which the Congress blatantly interfered with the most basic right to equality and injected a clause exempting minority institutions from all kinds of regulation (such as the RTE). this deprives the local majority (in most case, Hindus) of institutional control. This tips the scales heavily in favor of the Church and it’s ability to run schools (which by itself is fine and no one should be regulated by the likes of the RTE) but the sectarian nature of this one amendment has huge consequences. Also the Church can control it’s own funds but temples can’t. least interested in religion but I believe in absolute uniformity in law. This kind of an amendment is a huge thing and am surprised to see lack of discourse around it. Read about it from the reality check india blog.